A new assemblage from UMBC's premier research laboratories. We're Social. Follow us on Facebook and Twitter! Eclipse researchers with UMB research (Dr. Sandy McCombe-Waller) were recently featured in a video developed by Microsoft Research. The video showcases Banerjee, Robucci, and UMB professor Sandra McCombe Waller, as they discuss the application of Microsoft’s Lab of Things to the team’s wearable sensing system project. Eclipse has developed a novel proximity sensor-based system that analyzes driver movements and infers whether he/she is distracted or driving dangerously. The key novelity of our approach is that our sensors are built into head-gears, dashboards, and door mats inside vehicles and can non-intrusively detect dangerous and distracted driving using our novel signal processing algorithm. Our goal is to build these sensors into fleet vehicles. ECLIPSE Professors Nilanjan Banerjee, Ryan Robucci, and Chintan Patel have been awarded a $650,000 NSF grant from the NSF-NIH Smart and Connected Health program and a $150,000 TEDCO grant on wearable computing. Eclipse researchers have developed a micro-doppler radar array system that can detect subtle cheek and tongue gestures. The wireless system can be used for environmental control for individuals with severe paralysis. 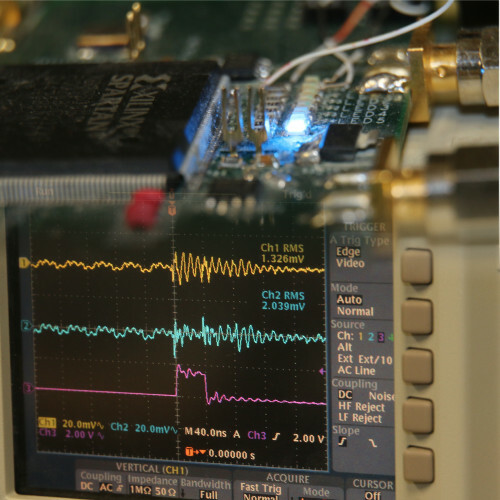 The Mobile, Pervasive, and Sensor System Lab (MPSS) performs research in cyber-physical systems spanning mobile systems, renewable-energy driven systems, and low power wearable sensors. The key focus is to use cross-disciplinary techniques spanning hardware design, software systems design, and analytics to build more usable and robust systems. The Covail Lab: cooperative technolgy research exploring ultra-low-power hybrid analog-digital computational systems, sensors, and hardware security. Study of biological systems is leveraged for inspiring signal and image processing algoritghms and sensor system design for embedded aplications including robust wearable, mobile, biomedical systems. The VLSI Lab focuses on EDA for reliable digital systems and low-power VLSI design. Research in Hardware Security, Power Supply Noise Analysis and Estimation, Delay testing enable development of secure and robust systems. An estimated 1.5 million individuals in the United States are hospitalized each year because of strokes, brain injuries and spinal cord injuries. Severe impairment such as paralysis, paresis, weakness and limited range of motion are common sequels resulting from these injuries, requiring extensive rehabilitation. This project is developing invisible sensing systems (using textile-based capacitive sensor arrays and micro-doppler radars) embedded into bed sheets, pillows, wheelchair pads, and clothing, for environmental control and physical therapy for such paralysis patients. The system detects gestures regardless of evolving environmental and patient conditions and provides explicit real-time feedback to the user. Through the use of low-cost and ultra-low power capacitive sensing and micro-radars built into headgears, the system reduces hospital visits and therapy costs. We study power-supply side-channel leakage on FPGAs and ASICs through hardware experimentaion and simulation. Our goal is discovery of new side-channel vulnerabilites along with techniques and EDA tools for coutermeasures in embedded systems. We are espcially focused on security for low-power embedded systems. Sidewalk navigation for the visually impaired, especially those who use wheelchairs, can be a daunting task. While laws advocate proper standards for accessibility-compatible sidewalks, several develop cracks and obstacles over time and many have curbs and steps. Emerging wearable devices such as Google glasses provide an opportunity for continuous vision-based systems that can navigate individuals around accessibility issues on sidewalks. Unfortunately, real-time vision-based navigation systems are scarce. The problem stems from a basic limitation of vision algorithms---without a priori contextual information on a scene, it is impossible for a vision algorithm to search for objects of interest. 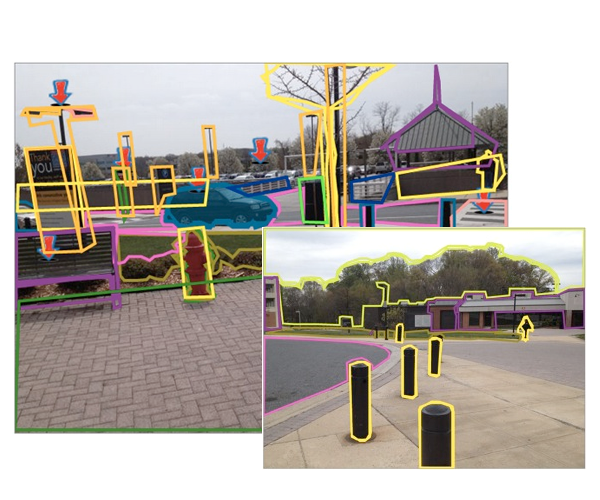 To address this critical problem, this project proposes a cyber-physical system that augments machine vision algorithms with a priori contextual information collected using human crowdsourcing. The key idea is to use humans in conjunction with custom system build a rich library of information on scenes with accessibility issues. This library can then be used to design context aware machine vision algorithms that can efficiently detect accessibility problems in real-time. © 2014 University of Maryland, Baltimore County - ECLIPSE Cluster. All rights reserved.